Live Jazz by the Chris Brydge Duo every Sunday during our Brunch Buffet 11am-2:30p.m. Prime steak lovers celebrate the opening of Opus 9 Steakhouse in Williamsburg's Trendy New Town Center. Opus 9 epitomizes the dining experience from quality of steakhouse fare to the diversity of the wine list, casual elegance, club-like lounge sophistication, ambiance, private dining accommodations and first class service. The cozy dining room offers a choice of plush booths, spacious tables, and fireside dining with just the right intimacy for an important business lunch or dinner or romantic special occasion. 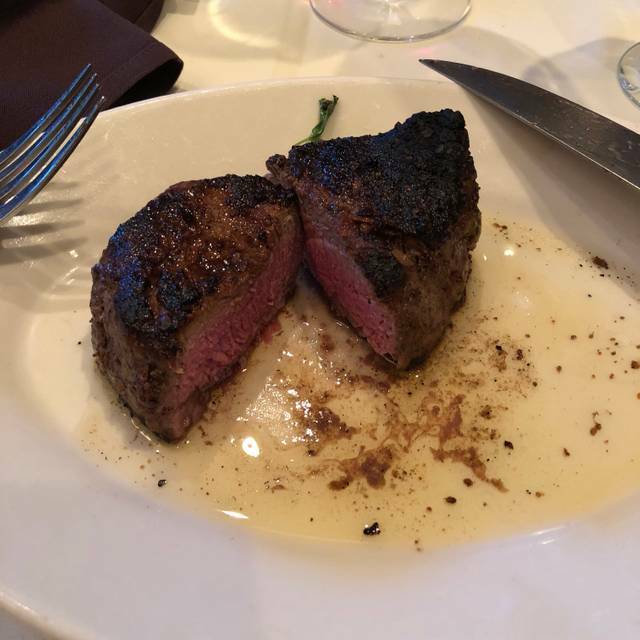 Delectable entrees are highlighted by our melt-in-your-mouth aged Prime Steak, such as Steak “Oscar 9” topped with Jumbo Lump Crabmeat, New York Strip Steak, Au Poivre and Bone-in Filet Mignon: all meticulously prepared to your specifications. 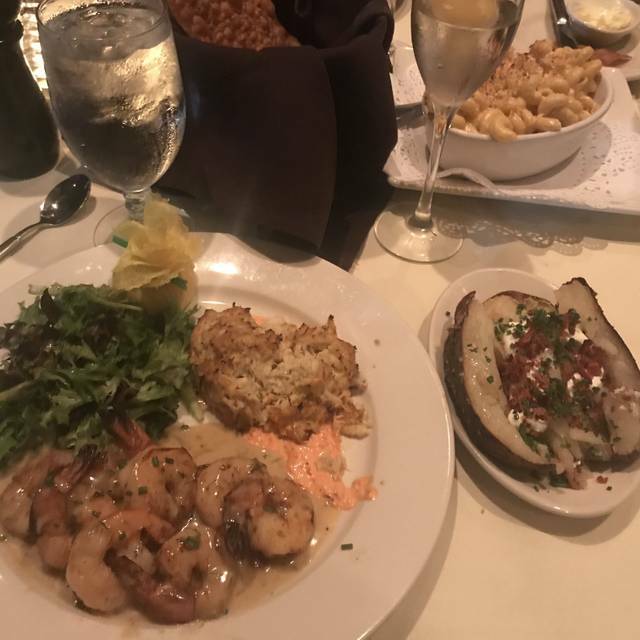 Live Maine Lobster, Bronzed North Atlantic Salmon, Award-Winning Jumbo Lump Crab Cakes, and nightly fresh seafood specials highlight the seafood menu. Been coming here for 7 years and the experience is consistently really good. Service is great and part of what sets it apart from many area restaurants. Steaks are naturally their specialty and they're fantastic. Great ambiance. Staff are very nice and never makes you feel rushed. Exceptional service by Cody, our server. Friendly, fun with conversation, happily provided suggestions, and made sure we were taken care of. My husband had the salmon and I had the filet. Cooked perfectly, and the suggested au gratin potatoes were terrific. 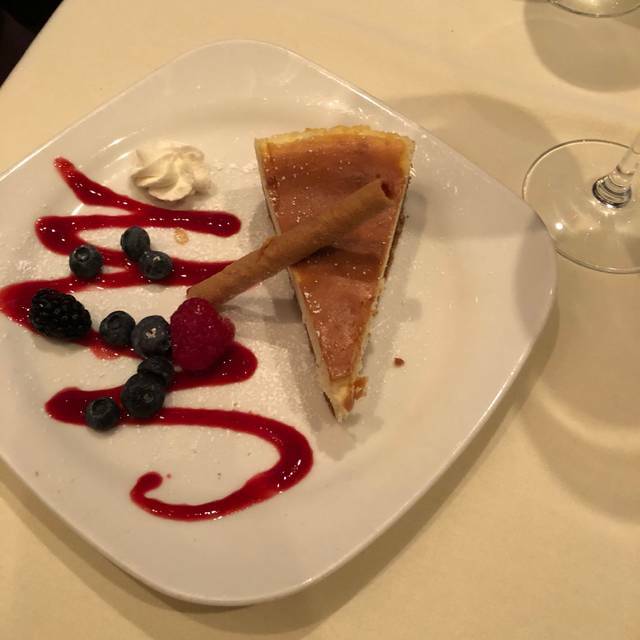 Dessert of cheesecake and creme brûlée were delicious! Service was excellent starting with the host stand, bar and dining room. Very professional and welcoming. Food was excellent. Dinner with family and everything was Wonderful! I wrote a previous review however I graded value I correctly. When I tried to edit I could not. Value was poor not excellent as indictated on previous review. Great as usual. Food was good and their $10 lunches are a great deal! Only downside was that we decided to eat outside and the pollen was overwhelming. We had to ask the waiter to wipe down our table, which was covered in green dust. They may have wiped them down that morning but by noon it was coated again. All-in-all, a minor inconvenience. It’s one of my friends and my favorite lunch spots! Very good steak and good service. Nicely decorated. Our dinner was a special occasion to celebrate both a Birthday and an Anniversary. The food and service was Outstanding as always. 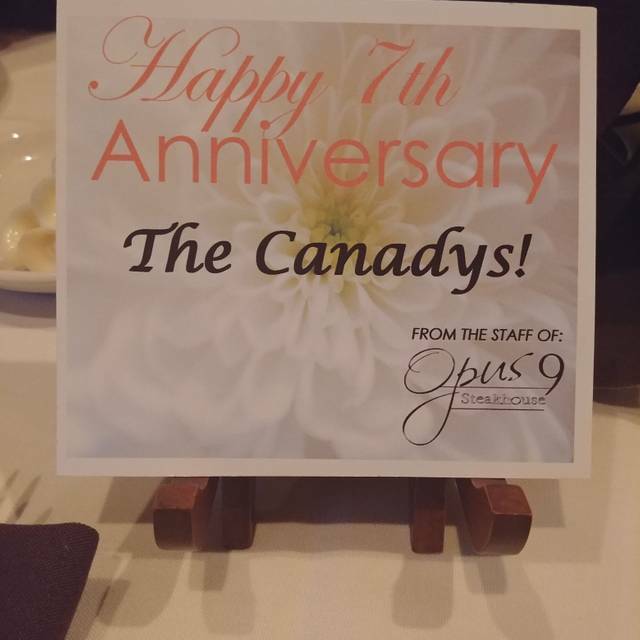 Our guests were from North Carolina and the absolutely love OPUS-9. We eat at Opus 9 at least once a year for our anniversary. 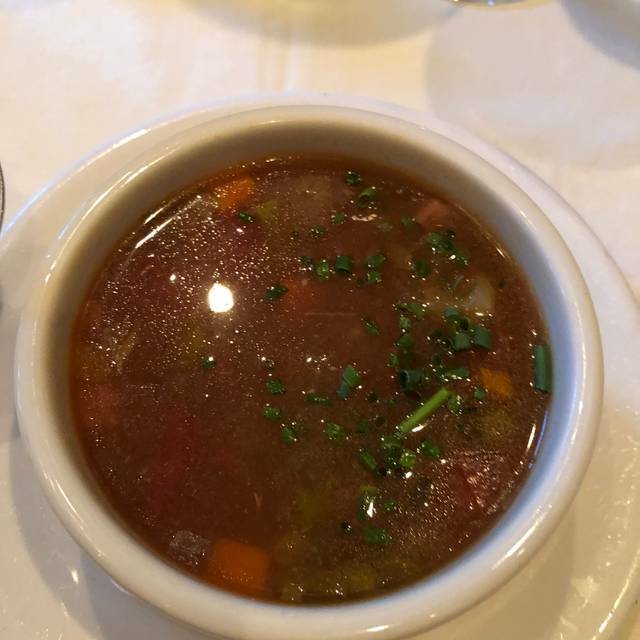 It is always an amazing dining experience, and we go all out! 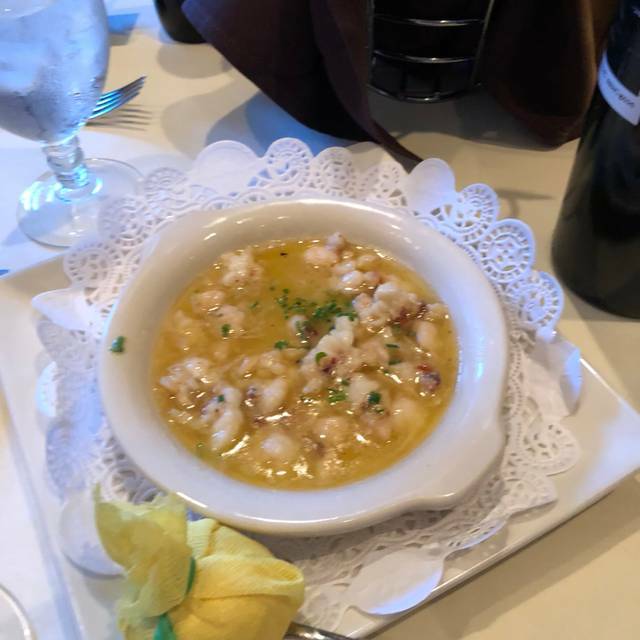 We appreciate having such a high end restaurant in our area for special occasions! Opus 9 never disappoints. We were in town for an alumni event at W & M and we took some friends there. The service was great, the lunch choices were varied and interesting, and we each ordered something different. I had barbecue and it was perfect. The onion rings I had with it were also delicious. I cannot say enough good things about Opus 9. This is a great place to celebrate special occasions. 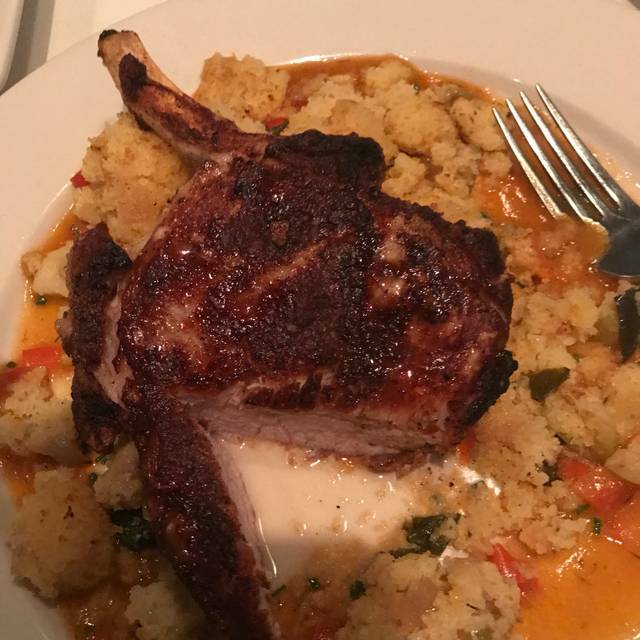 3rd time this year at this establishment.... My steak was under cooked and when it was returned it looked a mess and the manager said I can try again once I told her, I will just eat it (while still under cooked, she just walked away ( MY guest were shocked) and not the same portion size of my crab meat and the sauce was dried up. It was like they left more than half of my crab topping off since they tried to cook the same steak to my desired temp. I decided I will not to go back because of how the manager handled the situation. 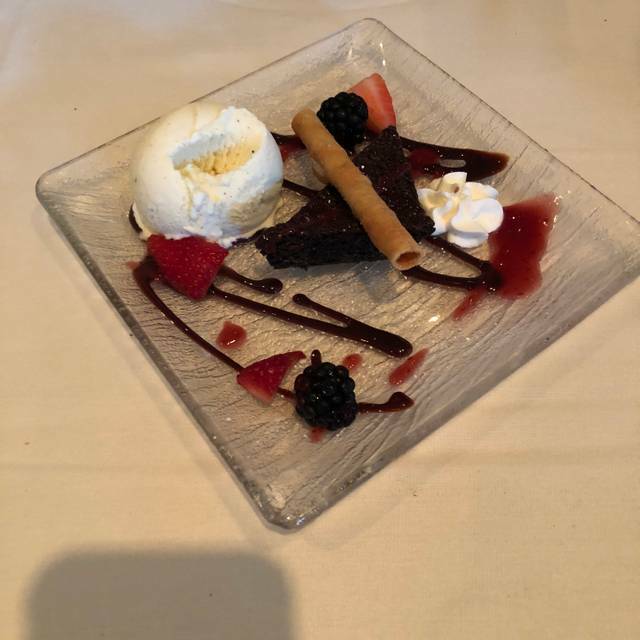 The sever actually brought out a brownie for me and said this is from me because of how your steak came back out and I saw your face and I could look at the plate and see what she returned to your table (Server Jason very thoughtful and paid attention to detail). Reservations for an early dinner - 6 PM. The bar was seriously loud due to happy hour. I told the hostess to seat us as far away from the bar as possible. She didn't. Actually put us in the room by the bar and next to the hall to the kitchen. Being an early dinner there was plenty of open tables in the two other rooms. My wife started to sit before I refused the table so we took it. Could hardly hear ourselves talk for about 15 minutes due to the waiter traffic to/from the kitchen and the happy hour. As for dressing up due to it being a nice place, don't bother. One guy dressed like a biker, two others dressed like they came from a sporting event. Not a biggie really considering this is a tourist town but we've come to expect this from Opus. Went to Monday night special, steak was dry, shrimp were very small. Service was outstanding as usual. We have had lunch and dinner there many times, this was the worst experience! Thank you for posting on Opentable; we review all posts in an effort to improve every day. I am so sorry your steak was dry & the shrimp undersized. If ever such a rare case arises, please do not hesitate to let us know when you dine. We do all we can to ensure we exceed guests expectations. We never wish for a guest to leave feeling as you do. I am so glad we were able to speak on the phone so I could offer personal apologies. Please look for a letter from me in the post in the coming weeks. Beautiful restaurant, amazing food and service. Great place to celebrate a special occasion! Should be some cold seafood like shrimp. Hot prepared foods were not impressive. Chef manning the omelet, waffle, carving station was excellent. We so enjoyed his attentive approach and his balance between being at the ready and not being over bearing. His food suggestions were spot on. We now have a new favorite restaurant in Williamsburg. The service was very good. Both of our steak s were prepare excellently and the flavor was outstanding. However my granddaughters garlic masher were cold and very dry. My bake potato was cold. The salad was also very good. My key lime pie portion was small without much flavor. Over all the experience was just above fair only because of the steaks were excellent. For 156.00 plus 40.00 tip for 2.people with out alcohol made it average at best. I’ve been here before and the food was excellent so I’m not sure what happened. My steak was bland and over cooked and so was my wife’s seafood. Not what I would expect for a meal that cost $140. Food and service were outstanding! Great night! Our out of town guests were very impressed with Opus 9. Went to dinner here for birthday. Steaks were very thin cuts. My wife and I both had the cowboy cut ribeye. Mine was cooked correctly but the taste was not good at all. My wife’s was a very poor cut with a solid piece of fat right in the middle of the steak. The manger did remove hers from our bill, but I will not be returning here for another meal. Yes, would definitely recommend to a friend as a good place to go for a special evening with good food and service. 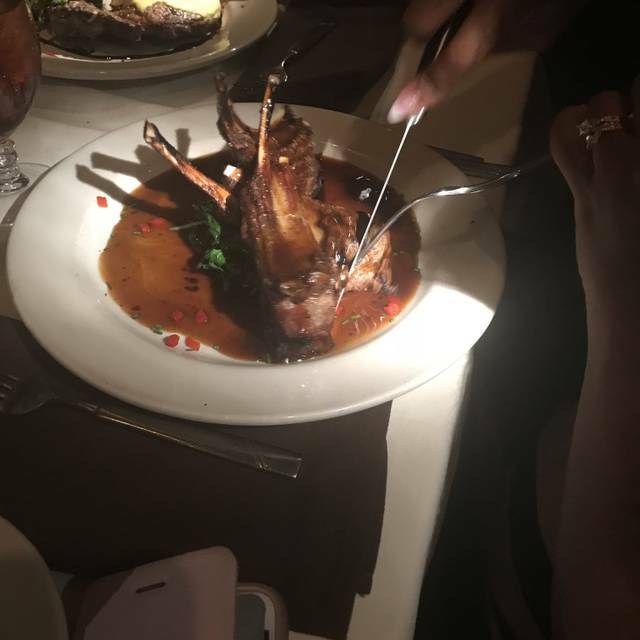 "The filet mignon and lobster tail was to die for. Combined with a mixed salad an potatoes au gratin and a French onion soup it ended being the most delicious meal I had in awhile. I was a relaxed yet elegant feel and outstanding service. The food came perfectly timed and the champagne by the glass was fantastic. Quality from start to finish. The food and service was superb, and we’ll definitely be back!! As always Kara did her excellent job taking care of us... The table was ready, greeting friendly and genuine... The wine suggestions worked fine for both of us.. The food was great, all servings came a perfect pace. All was great, look forward to our next visit.. The food was good as usual, and the wait staff is very professional. Twice each year it is my responsibility to select a restaurant for our retiree lunch bunch. My past five selections have been Opus 9. Need I say more? The Land and Sea dinner (Sundays and Mondays) was one of the best that we and our guests have ever had. Service was excellent and we could talk with no problem (at our ages that's not always true). As one of our friends said "If we lived in Williamsburg, we might come every Monday night for that dinner." Our server, Austin, was very good, very attentive. The prime rib was extra exceptional this trip. Love the smoked salmon, fresh fruit, etc. A couple of the entree choices were not my favorite this trip, but that's just personal preference and I've never felt that way before. Consistent and excellent as always. My favorite special place. Presentation was very nice. Food was excellent. Very enjoyable experience. Will definitely go again if in Williamsburg. We were very disappointed in our meal. Our salads came out at the same time as our appetizer; the waiter broke a wine glass on the table and rather than getting a new table cloth, we picked glass shards off our clothes and the table all evening; and my steak was under cooked. It was very rare in the middle and I had asked for medium. All in all it definitely wasn't worth the price - and frankly, it wasn't an enjoyable evening.